Respect and Time – this is Important! Scrum has a set of ceremonies, some considered essential, some optional. What’s important is that they are held at consistent times. Er… ok. Why’s that important? Well, firstly, this allows for the attendees, both participants and observers, to plan their time well. It sets the heartbeat of the team, and allows for the measures that we use for a team’s predictability (velocity, Say/Do, cycle time) to have some basis in reality. Reality! Yay! This is good. If your team is consistent and reasonably predictable, this is highly valuable to the business, as it allows them to do high level planning with increased confidence. Benefit to you: they’ve got fewer reasons to ask you to do crunch-work. Secondly, there’s a bad side to not doing this, setting up regular ceremonies. What does the bad look like, and why is it bad? One of my favorite life principles is that you can always make more money, but you can’t make more time. (Despite claims to the contrary.) So respecting others’ time is fundamental. Being late or inconsistent around appointments is basically sending the message “My time is more important than your time, actually. Nyaah!”. 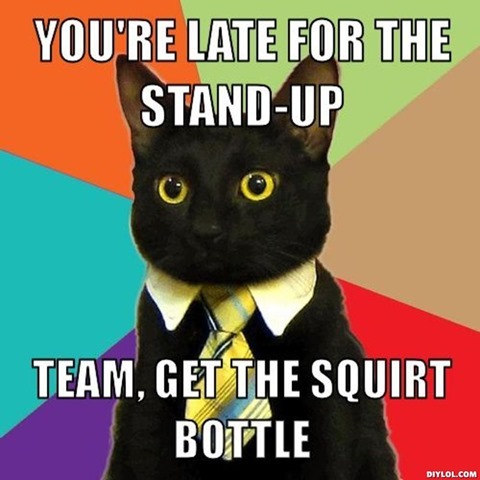 It’s incredibly rude, and it’s a sure-fire way to undermine credibility, trust, and team cohesion. Is that worth it? I’ll be writing in due course about the SCARF model (see David Rock, “Your Brain at Work”) The “S” stands for Status. Sending a message that they are less important than you, even if that’s true, is an assault on their status. It activates a threat response, either having them unable to think clearly, or if strong enough, activating a fight / flight / freeze / appease response. That’s no way to run meetings. Said another way, it’s a great way to get people pissed. Can you see how much sense it would make to show respect for people’s time? 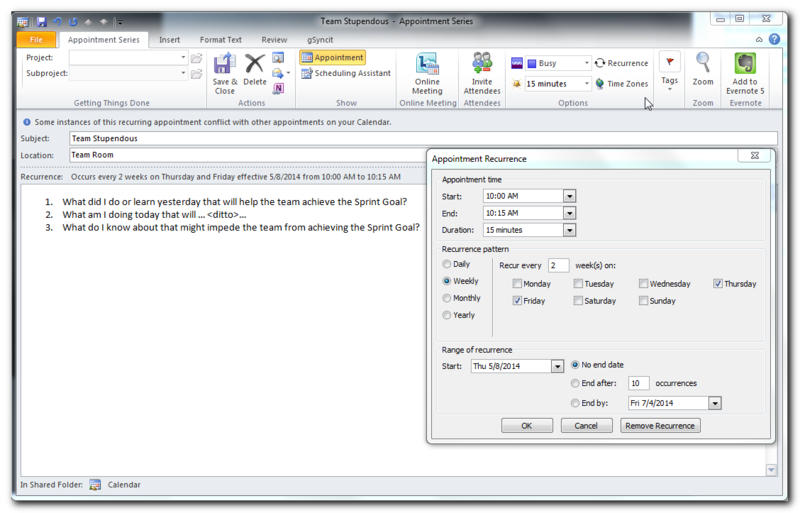 Here’s an example of the kind of schedule you might want to set up, and how to use Outlook to support the team. Sprint Planning: Wednesday 10:00 am to 11:00 am, recurring every two weeks on Wednesday, starting on first day of first Sprint. Invite Team, Product Owner can forward to stakeholders, also possibly engineering managers if they can act as technical consultants not bosses. Story Grooming: First Friday 3:00 pm until 4:00 pm, recurring every two weeks on Friday, starting of first Friday of first Sprint. Same invite list as for Planning. Sprint Demo: Second Tuesday 11:00 am until 12:00 pm, recurring every two weeks on Tuesday, starting last day of first Sprint. Same invite list as for Planning. Sprint Retrospective: Second Tuesday 2:00 pm until 4:00 pm, recurring every two weeks on Tuesday, starting on last day of first Sprint. Invite to Team only. First Thursday and Friday, 10:00 am to 10:15, recurring every two weeks on Thursday and Friday. Invite to Team as contributors, anyone else as observers. Every weekday (middle week), 10:00 to 10:15, recurring every two weeks, starting on First Monday of first Sprint. Invite as 1.1. Last Monday, 10:00 to 10:15, recurring every two weeks, starting on last Monday of first Sprint. Invite as 1.1. 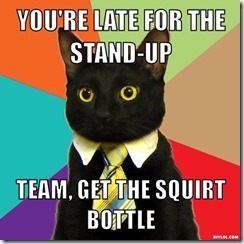 Outlook recurring meeting for first two Stand-ups. Wow, that’s a bunch, am I right? But you only do it once! Get the people in the team to schedule the time they want to protect at work, so to other’s it’s clear that this time is Busy in Outlook. 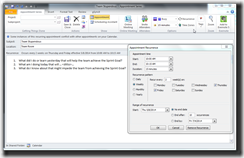 In Outlook, have them add something like Daily, 9:00 through 10:00 Deal with email; Daily 11:00 through 5:00, Concentrate and Collaborate. Outlook always allows you to Tentative Accept or Decline just one meeting instance. Use that sparingly. Release Planning, Release Retrospectives, company All-Hands and Offsites, sure they will take precedence. Give people robust feedback if these get scheduled at the last minute, that’s not acceptable professional behavior. But what are you telling the world if they look at your Outlook schedule and just see that it’s mostly free? It’s permissions to mess with your days my throwing meetings at you any old time. You’re asking for a drop in “S”!